Healthy and Slim Daily Greens in powder and tablets contain the highest concentration of Gluten Free Certified Organic Greens and vegetables per tablespoon( 2 servings) than other product blends while avoiding potential irritants, fillers, and allergens. Increases daily Veggies, Great taste alkalinizing formula, Powder mixes great into water or smoothies. Formulated for all people including adults, children, teenagers, seniors, Athletes and even safe for pets! 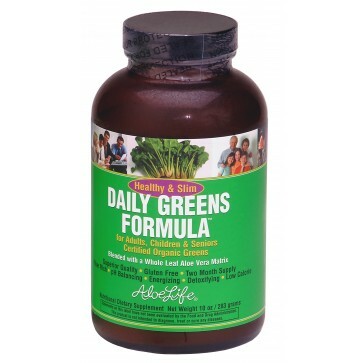 p>Healthy and Slim Daily Greens in powder and tablets contain the highest concentration of certified organic greens and vegetables per tablespoon( 2 servings) than other product blends while avoiding potential irritants, fillers, and allergens. Since 2001 - packaged in glass for freshness Daily Greens Formula has been made for all people including adults, children, teenagers, seniors, Athletes and even safe for pets*! Pregnant, lactating women, along with bowel sensitive individuals enjoy H&S Daily Greens who want to improve nutrition encourage healthy regularity while reducing daily gluten (gluten free). Great taste and easy to mix into water, smoothies, or foods. Super nutrition supports the Daily Vegetable Recommendation of 5-11 servings. Reduces snacking between meals and Supports Healthy Weight Programs. Grains are sprouted to eliminate Gluten and increase nutrient values; Vitamins (to include Folic Acid), Minerals, and Proteins for wellness. Contains 70% Organic ingredients and Gluten Free. Supports daily Regularity, Cleansing, and Detoxification. Alkalanizing Action with Abundance of Minerals. Enjoy both the energizing & Calming Action! Certified Organic Ingredients include: Sprouted Barley Grass Juice, Sprouted Wheat Grass, Sprouted Alfalfa, Parsley, Chlorella, Hawaiian Spirulina, Whole Leaf Aloe Vera. Renewall & Detoxification herbs; Kale, Water Cress, Dandelion Greens, Broccolli Sprouts, Beets, Green Papaya, Satisfaction Guaranteed! 8 Tablets or 1/2 tsp contains approximately 3 servings of vegetables! Start on 4 Tabs a day (1/2 tsp powder) for at least 2 weeks before increasing because it is very cleansing. It does not contain fillers or irritants to gluten intolerant individuals such as beans, seeds, wheat, gluten, flax meal, psyllium, apple pectin, oat bran, wheat bran, soy, tomatoes (night shades), brown rice, herbs, other veggies (common in other greens). Detoxify your body with the power of these incredible green vegetables. Individuals have noticed an improvement in skin, energy, regularity, loss of unhealthy water weight, reduction of achey joints and overall wellness *Use caution if on blood thinners. Try it you will love it and your body will thank you! I have used many other greens products over the years yet the Daily Greens is a combination of the most important ingredients ever! I love the way I feel taking them almost every day!